Monster commutes: Should yours make the list? 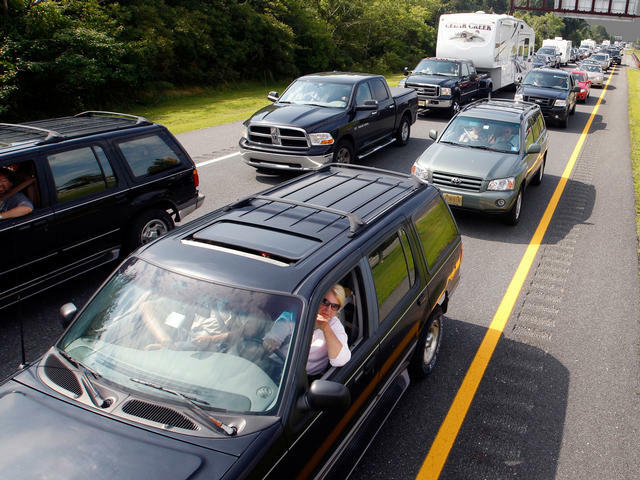 (MoneyWatch) According to U.S. Census numbers, 3.2 million Americans commute 90 minutes or longer each day. While listening to podcasts or carpooling with a friend can help pass the time, most of us would agree that the shorter your commute, the better. But for some far-traveling folks, 90 minutes is just a drop in the bucket. Below are four crazy commutes. Can you relate, or is yours worse? Please share the details in the comments section. I work in New York City and live in Virginia. I leave on Sunday and return on Thursday. I have flown home for one night to catch the 6 a.m. shuttle out of National (D.C.) back for a 9 a.m. meeting, and have driven through the night on many urgent occasions. Instead of romantic nights with my husband, I spend them with Amtrak watching Baltimore pass by. I am masterful at finding something healthy to eat on the New Jersey Turnpike and can change from my pajamas into my suit as I drive into the parking garage in Manhattan. -- Megan Megale, Centreville, Va.
My commute is horrible. I take two trains and a subway to get to work, totaling about two hours door to door. So basically, I spend 20 hours a week commuting. And that doesn't even consider the fact that my train sometimes doesn't show up at all. And when that happens, the next train has to fit two trains' worth of people, a.k.a. standing room only. Overall, the biggest hassle of commuting is the unknown. You truly never know what kind of hurdle you could encounter on your way into the city. Two hours can easily turn in 3 hours at any time. --Alissa Katz, commutes from New Jersey to New York City on NJ Transit. I live in the suburbs of Atlanta. Atlanta has the worst mass transit system in the world. I live about 32 miles west of my office. The entire drive takes anywhere from 1 to 2 hours each way. What makes it brutal is that the road seems to drive directly at the sun. If you are not prepared, this sun can be literally blinding. When cars turn towards the sun, traffic comes to a screeching halt. Many are unprepared, which leads to wrecks and slowdowns. Going home, the entire process is repeated as the sun going down makes traffic a nightmare. I used to have the world's worst commute, from Loveland, Colorado, to Colorado Springs. Why? Because I would have to check three areas for weather and road conditions because of the changing altitude, as I could go through sun, rain, hail and a blizzard all in the same trip! From high winds, wildfires, ice, rush-hour traffic and road construction, it was unpredictable. On a good day, the 113 miles one-way trip could take from 1 hour 45 minutes to 2 hours. During extreme weather conditions, it sometimes took up to 5 hours! --Lynette Kittle, Colorado Springs, Colo.